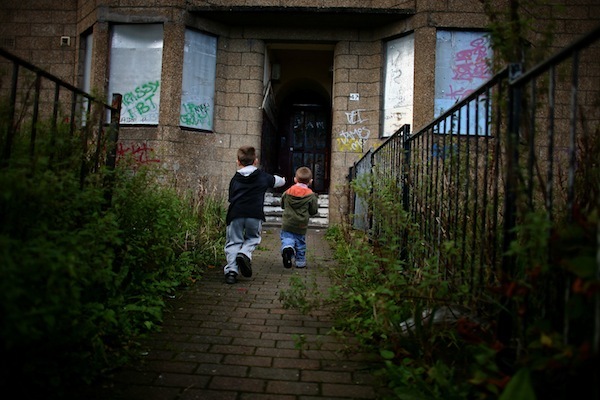 Parts of Wrexham have the highest levels of child poverty in Wales, a new survey has shown. Today’s End Child Poverty Campaign report showed nearly a quarter of all children in Wrexham live in poverty and Plaid Cymru has called for a dramatic change in the UK Government’s spending priorities. They want nuclear missiles and the high-speed train link HS2 scrapped to save billions of pounds. Queensway Ward in Caia Park has the highest percentage of child poverty anywhere in Wales, with nearly half of all children (49.03 per cent) living in poverty. Plas Madoc and Pant Wards also have over 40% (41.21 and 40.9 respectively) living in poverty. Plaid Cymru says that the Government’s programme of cutting public spending, often referred to as Austerity, is hurting the most vulnerable and forcing families into poverty, with the Labour Party promising to continue with the Conservative Government’s Austerity programme if they got into Government. However Plaid Cymru said that the Government had money to spend on vanity projects which contribute nothing to the lives for people in Wrexham. Plaid Cymru said that the way to bring these children out of poverty was by securing good quality jobs and increase investment in the area. Plaid Cymru’s parliamentary candidate for Wrexham, Carrie Harper, who lives in Caia Park, said: “These figures are a damning indictment of the way the UK has left our most vulnerable behind. We’re told that these are difficult economic times and cuts have to be made to reduce the deficit. The deficit was brought about by bankers and City Traders gambling our money and then being bailed out with taxpayers’ money. Recent research by the London Health Observatory found the gap in life expectancy between those in the most affluent and deprived wards is now nearly 25 years. The End Child Poverty Campaign also says that poor children are born smaller with a birth weight on average 130 grams lower in the poorest children. Poverty also shapes children’s development. Before reaching his or her second birthday, a child from a poorer family is already more likely to show a lower level of attainment than a child from a better-off family. By the age of six a less-able child from a rich family is likely to have overtaken an able child born into a poor family. Children aged up to 14 from unskilled families are five times more likely to die in an accident than children from professional families, and 15 times more likely to die in a fire at home. Children growing up in poverty are more likely to leave school at 16 with fewer qualifications. Mabon ap Gwynfor, Plaid Cymru’s parliamentary candidate for Clwyd South said: “The Government has got its priorities wrong. The London parties have enough money to spend on nuclear weapons such as Trident and a new high-speed train line from Leeds to London, but claim they have no money to spend on tackling poverty and creating jobs. “By scrapping these two vanity projects and sharing out the money saved, Wrexham Council alone would be around £17m a year better off.